Jim Tressel is no longer the head coach of the Ohio State football team. He resigned yesterday amid a growing scandal which involved OSU players selling memorabilia in exchange for tattoos and other items. The fallout was pretty predictable. Buckeye fans were asking what the big deal was. “After all,” they reasoned,” it’s only tattoos.” It’s not like OSU was paying players to come play football and giving their parents homes like USC did with Reggie Bush. Or having an ACTUAL PAYROLL like SMU did back in the 80’s. This is just a couple of autographs that were exchanged for tattoos. No harm, no foul. The problem with that argument is that it ignores the real violation. According to the official timeline, Tressel first learned of the memorabilia-for-ink scandal back in April of 2010 when he received an e-mail from a Columbus lawyer stating that some of his players were selling OSU memorabilia, a clear violation of NCAA rules. At that point he should have reported this to the University. But he didn’t. He sat on the email because, according to him, he “couldn’t think” whom he should report it to. The NCAA rules are pretty clear. Any violation MUST be reported to the coach’s superiors. Tressel failed to do this. In December of that same year, the US Justice Department informed Ohio State that they have uncovered evidence that OSU players were selling memorabilia for tattoos. (Justice was investigating the owner of the tattoo parlor for drug trafficking.) At that point, Tressel said he had no knowledge that his players were engaged in such activity, which was a lie. He knew what was going on back in April. It wasn’t until April of this year that Tressel, under pressure from a Yahoo Sports report, held a press conference and finally admitted he knew what was going on way back in 2010. That press conference pretty much sealed his fate. The NCAA will forgive a lot but failing to report a violation is not one of them. And lying on top of that will only make it worse. And Jim Tressel did everything to make it worse. If history has taught us anything it is that the cover up is always worse than the crime. From Richard Nixon to Martha Stewart. From Bill Clinton to Barry Bonds. When you lie to the powers that be, whether it be the NCAA or the US Government, you just make things harder on yourself. Many fans in Buckeye Nation are trying to float the argument that Tressel was sticking up for his players. He was trying to protect them. His loyalty to his players is a virtue and he shouldn’t be punished for that. While I agree that loyalty is important, I’m not sure that’s what he was doing. His “loyalty” to a few key players has hurt many more innocent players. What about the rest of the players on the team who didn’t break NCAA rules? They are going to be the ones who have to take the punishment form the NCAA. 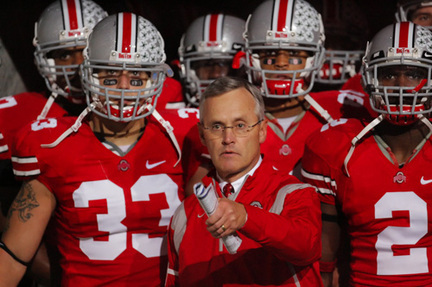 Where is Tressel’s loyalty to them? The football program will most likely lose some scholarships and may have to vacate some victories, perhaps even a whole season. The players named in the scandal may never play another game for Ohio State. Some of them, like quarterback Terrelle Pryor, may head for the NFL and avoid any kind of punishment. The only ones who will be punished are the players who followed the rules, Jim Tressel, THE Ohio State University and the fans. If Tressel had turned over the e-mail he received back in 2010 and told the truth he may very well still be the head coach of OSU football and the city of Columbus would not be in mourning today.